For More than twenty years the Camp Grayling Conservation Club has sponsored and staffed the running of the Buck Pole. Hunters are awarded prizes in various categories such as first buck for the day or youngest hunter. The deer are not only weighed but the antlers are measured and a scoring system that takes into consideration total spread, number of points, and length of points assigns a score used to determine the best Buck of the two days. The overall winner for the days receives a new scoped hunting rifle. It is possible to win a prize in more than one category. Jack Millikin, owner of Skips Sport Shop, stated “we have some nice deer brought in this year with many hunters having better luck than my own so far for firearm deer season 2016”. The 58th Annual Grayling Buck Pole is now in the books. At dawn on the first day the temperature was 33 with severe fog. A weather fog alert was in effect until 9 a.m. slowing everything down. At the end of the day 15 deer were recorded compared to last year’s 19 bucks. 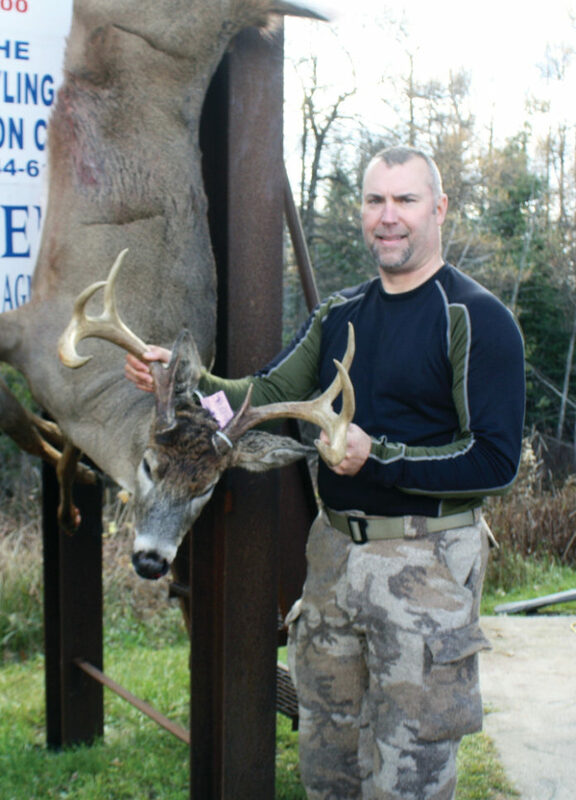 Thomas Hause of Grayling was first with a 9-point. Seven year-old Brooklyn Robinson rolled in with a 110 pound 6-point. She was the first female of the day and was headed back to Mrs Shory’s second grade Grayling Elementary class. Following the pair was: Glen Hatfield (157 pound 8-point; Lee Schreiber (110 pound four-point); Art Wargo of Rochester Hills arrived with a 115 pound eight point; Keith Persichini of Frankenmuth (137 pound 6-point)’ Ryan Halstead (145 pound 8-point); Jason Wilson of Grayling (100 pound 4-point); Steve Moon of Grayling (145 pound 8-point); Garrett Riley of Grayling brought in a 115 pound 3-point). Volunteers from the Camp Grayling Conservation Club said 6-year old Brody Partello arrived at 11:15 with a 112 pound 4-point). He attends Grayling Elementary in Ms. Hatfield’s class. He enjoys math and gave his dad a big hug after taking the buck. Also bringing in deer opening day were Noah Kolka of Grayling (147 pound 7-point; Mike Wakeley 130 pound 8-point; and John Schwark (150 pound 10-point. The last deer of the day was bagged by Tyler Rock of Grayling , a 107 pound 7-pointer. Day Two started with partly cloudy skies and 40 degrees. The first deer to arrive were taken the night before after hanging on the buck pole had concluded. Mallory Hatfield dropped off her deer taken the night before that was a 125 pound 3-pointer; and Cody Collen (170 pound 8-point). The first deer of the day came in at 10:40 a.m. It was a massive 205 pound 8-point buck that measured 151 inches. Also bringing in deer the second day were: Bill Reichelderfer (65 pound 8-point’ Bob Fay of Roscommon (157 pound 10-point); and Brian Jacobs of Frederic, who was the last to arrive with a 120 pound six point. The Camp Grayling Conservation Club stops hanging deer at 5 p.m. and they are taken down at 7 p.m., giving everyone a chance to see all of the deer. For 23 years the Camp Grayling Conservation Club has sponsored and staffed the running of the Buck Pole. Hunters are awarded prizes in various categories such as first buck for the day or youngest hunter. The deer are not only weighed but the antlers are measured and a scoring system takes into consideration total spread, number of points, and length of points assigns a score used to determine the best Buck of the two days. The overall winner for the two days receives a new $800 scoped crossbow. It is possible to win a prize in more than one category. Partly cloudy. Low 18F. Winds NE at 5 to 10 mph. Mostly clear skies. Low 13F. Winds NE at 5 to 10 mph. Partly cloudy skies. High 32F. Winds NE at 10 to 15 mph.